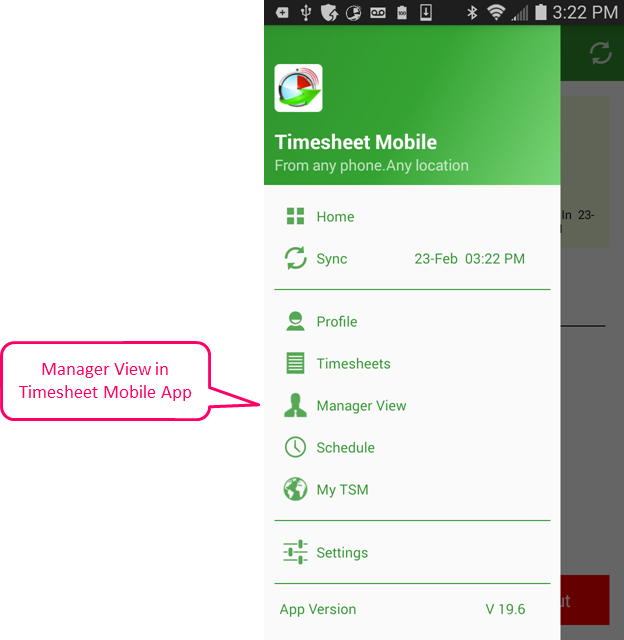 The Timesheet Mobile smartphone app for Android and iPhone now makes it even easier for managers and administrators – assigned via the Employees page – to punch in and punch out employees in their designated workgroup(s) through Manager View. 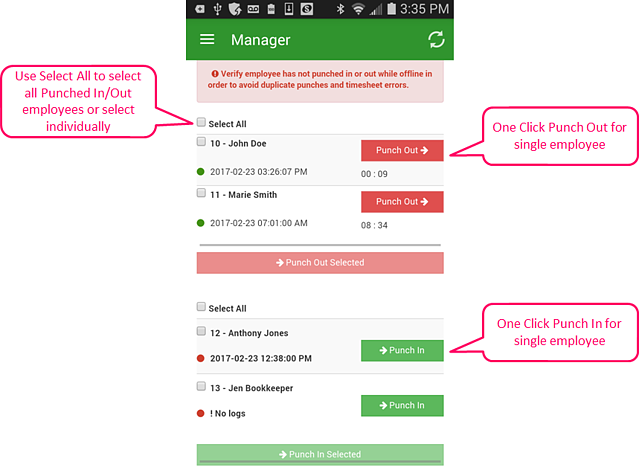 Using their Timesheet Mobile smartphone app, users who have downloaded Android version 19.6 or iPhone version 8.0.0 can access the Manager View page, where a list of employees who are punched in and punched out is displayed. Administrators and Managers can punch in/out individual employees, multiple employees or all employees with a single click. When punching in, the option to select which Customer:Job and Task the employee is working on is provided, making it even easier to use our clock in clock out app for all employees in your workgroup. Use caution not to punch in or punch out employees who may be using the app and are offline. This will prevent the possibility of creating errors that will need to be corrected on the back end. You've asked for the ability to easily make unused Employees, Customer:Jobs and Tasks inactive. Make Inactive reduces the number of items in your active tables and can simplify the use of Timesheet Mobile for administrators and employees alike. For employees, the process of making an employee inactive is as simple as selecting the employee and clicking "Make Inactive". Once inactive, employees are blocked from punching in/out and will no longer have access to log in and view their timesheets. Inactive employee data is retained and their employee number cannot be reused, preventing confusion. In the case an employee returns, the process of reactivating is as simple as selecting the employee and clicking "Make Active". Once reactivated, employees will be able to punch in/out and access their time via the website. Making your Customer:Jobs and Tasks inactive will remove these items from the active table and also from your employees' smartphone app list – once their app has been synced with the server (either manually or automatically every 6 hours). Did that employee return to work? An old customer called and wants additional services? No problem ... one click and the item is active again. Attention QuickBooks Users! Continue to use QuickBooks to manage your active/inactive Employees, Customer:Jobs and Tasks (service items). Any items made inactive within Timesheet Mobile that are still active in your QuickBooks Desktop or Quickbooks Online configuration will cause duplicate items to be created. Please Customer Support with any questions you have about the Manager View and Make Inactive features.